Despite its long history, L'Artista Moderno is extremely scarce and little known outside Italy. It is one of the most important sources on contemporary decorative art, particularly the Stile Liberty (Art Nouveau) style, in Italy during the period covered by designinform ReVIEW. It was published bi-monthly and contains well-illustrated articles on ceramics, glass, furniture, poster design, graphic art, jewellery metalwork, textiles, interior design and architecture. 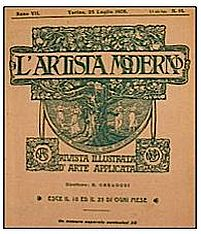 In its latter years L'Artista Moderno was superseded by more radical Italian arts journals such as Domus.